Kinex Media is pleased to launch the new website for Siddash Inc.
Siddash Inc. was founded with the vision of making ERP affordable to every small and medium enterprise in Canada. 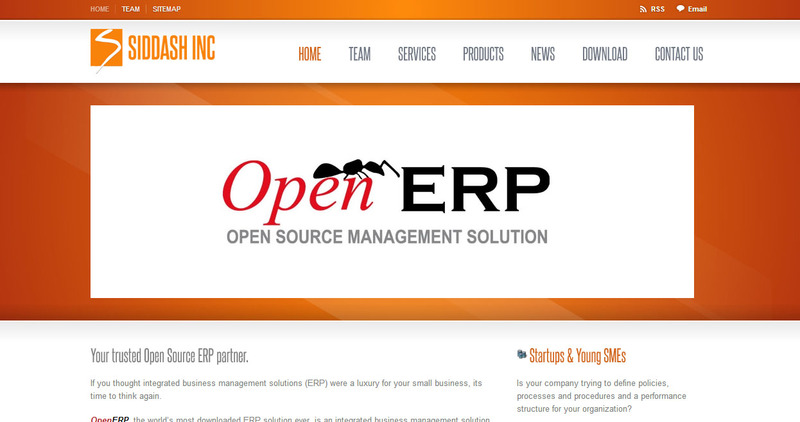 Together with OpenERP S.A, They believe that business applications should not be a luxury. That any company, in any country, should be able to afford the best tools to expand their businesses professionally. By embracing a very different and unique open source business model, Siddash inc. is committed to make the best-of-the-breed business applications available to their customers. Kinex Media is pleased to announce the launch of new website for Siddash Inc. dedicated to providing information on its services, as well as the latest trends in the Open ERP industry. The new user-friendly website allows visitors to gain a comprehensive understanding of Siddash Inc. and provide an industry leading resource for information on Open REP technology. The content management system (CMS) developed for the new Siddash Inc. website continues this trend of quick and easy updates. Rather than having to rely on a web developer to update the website, the content management system basically brings access to the Siddash Inc. itself. They are better able to publish content in a timely manner and content is standardized (formatted) to be consistent with the overall website design. The bottom line: Siddash inc. doesn’t need a website developer on staff and they don’t need to wait to make changes and updates. Their simple to use and a very dynamic content management system is a great fit for them.